I was recently asked to present at My Charity Connects – an annual sold out conference helping non-profits understand how to use emerging technologies for social good. I had a tough mandate – the conference organizers had pre-sold the topic “Developing a Digital Roadmap” – intended to be an advanced topic – to which 60 people signed up – all before I was asked to be a speaker. The topic was a good one and, in my experience heavily in demand, and so I was pleased to get @canadahelps (Amy)’s call. Truthfully, I find it tougher to speak on strategy development versus any random social media topic. It is a topic that runs the risk of being dry, difficult to explain, hard to share frameworks, and perhaps at risk of presenting motherhood. Right or wrong – I always perceive non-profit audiences to be generous and forgiving and so, I boldy looked adding the frameworks that have both shaped my thinking over my career or included ones that I’m still working on. The first is the concept of consumer expectations – that there are basic, satisfying and differentiating expectations (experiences) that a consumer has. Basic expectations are experiences that must exist for consumers to do business with you. Without them, consumers will leave your franchise. This may include presence in social media channels, response and interaction. Satisfying expectations make consumers happy but do not grow market share. So businesses should not over-invest in these areas. Finally, differentiating experiences are ones that consumers would switch brands, competitors for. Of course – this framework begs the question on what qualifies as a basic, satisfier & differentiator experience. 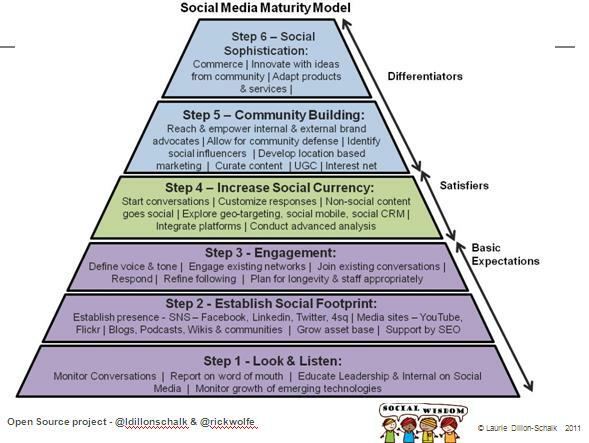 So the next chart was my “social media maturity” framework – that I’ve been futzing with for a number of months. This entry was posted in customer experience, digital strategy, social networks and tagged customer expectations, digital strategy, how to develop a digital roadmap, how to develop a digital strategy, mycharityconnects, strategy lesson on June 15, 2011 by Laurie Dillon Schalk. The new home page of 2011 is the tab in Facebook. There is a new kind of home page and its not where you’d expect – check out the best new facebook landing pages that introduce mashups of corporate social presence, address audience segmentation, and are as rigourous as any home page you’d see on a corporate website. American Red Cross is my new favorite page. The landing page is the default for first time visitors, after which, on repeat visits, you end up on the wall post page. [I didn’t know you could set cookies on facebook]. This page is definitely informed by an information architect/usability specialist – see the top utility menu and e-mail prompt for alerts, clear alignment, great labelling, rss news feed capabilities, maps, integration of other social medias – clearly making all the digital assets work very hard, very integrated all on one page. Strategically – this is an exceptional play. Facebook continues to capture a large portion of internet time away from the long tail of the web [that is – all other websites including most corporation’s branded sites]. With the decentalization of the net, companies with strong facebook assets have ample opportunity to create hard working facebook pages to meet their customers where their customers spend the most time. Understand the facebook consumer behaviour: If, when a visitor comes to a facebook fan page landing page instead of the traditional ‘wall post’ landing page – they will often go to the wall page anyways. The wall post page is, after all, the heart of company led and consumer led conversation fused together. And so – to introduce a landing page default can make for a more effective use of a visitor impression. 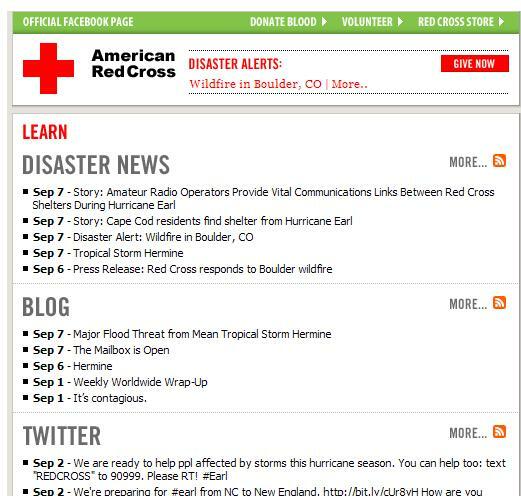 Now make that landing page a home page like American Red Cross. I haven’t seen this in Canada yet – but noted that Coca Cola has something similar. This entry was posted in customer experience, Facebook, fans / loyalty, social networks and tagged American Red Cross, best facebook page, Facebook fan page, facebook innovation, landing page for facebook on September 8, 2010 by Laurie Dillon Schalk. Toronto’s Scotiabank BuskerFest is in full swing today – with three more full days left of the downtown Toronto festival. As part of our social efforts – we are ‘live blogging’, for a lack of a better term, mostly on Facebook and Twitter with twitpics, tweets, posts, videos and more throughout the festival. At the risk of sounding like I’m blowing my own horn, Events 2.0 is bloody hard work making simple tweeting feel like a cookie next to a five tiered cake. Live event coverage using social media is requires full 12 – 16 hr dedication as majority of tweets are noon to late evening. Authors need sleuthing skills to also find the conversations that are not following you. Its not just about tweeting upcoming events or the schedule (which is major enough for a static display that changes frequently – errr). More importantly, the focus has to include making the overall conversation of others heard. That means sharing the twitpics of the masses, etc. Admittedly, I am conscious of not wanting a ‘big brother’ feeling to come across but play a fine line of attentiveness. Identifying communication bottlenecks and pushing the information out. I believe this to be an advanced skill. Looking at the operation of a business (in this case, an event) and figuring out how to apply the strengths of marketing vehicles against painful customer experiences. For BuskerFest – the schedule is large, well managed and central in the festival – but there you have it.. it is not virtual. I wish Social Wisdom (us) had been hired earlier so to have integrated our twitter addresses onto the physical signage at the event. Don’t force the hashtag. We created #bfto thinking it would be shorter, taking fewer characters and make retweeting easy. But I can’t promote #BFTO enough. The audience is naturally choosing the brand name of the festival – buskerfest – as its #buskerfest. I actually tried to inform the first #buskerfest user but then I realized that is the collective – the wisdom of the crowd emerging. Pretty cool actually. Keep the thick skin. We [the festival] got called ‘jackasses’ and given a #fail by @rjstewart as the website isn’t iphone compatible. [i didn’t do the site, the site has a lot of positives and honestly, as webby as I am – I wouldn’t have thought about making it iphone compatible before April – when I got my own itouch] [note to self – look up the penetration rates of various devices] So @rjstewart – your tweet is fair enough and true – albeit a bit harsh. But I do understand that very geek passion as I too love to pick at slow adoption and I know it is a comment that likely represents the frustration of more people. I truly believe that the online behaviours and expectations of Canadians (and North Americans) are on fire right now and firms are finding it very difficult to catch up. As indication, Social Wisdom has been contacted by several different agencies who are suddenly seeing ‘social media’ as a key skill and experience needed in RFPs – it is a talent hole in many agencies. As a last comment – the very ironic thing today was me sitting in Starbucks doing live event coverage while also sitting next to Epilepsy Toronto’s PR person. First off, the PR person is a fantastic person – well connected and, quite clearly, managing a full load of traditional press coverage. And she was busy writing up a press release for the world record that we facebooked about an hour earlier. She was very pleasant about it – asking if I could share some twitpics on the deal. I then pulled up tweetdeck and was showing the stream of tweets and follower responses. DW is great to work with – she was really embracing the social media and also thinking about how we could collaborate and integrate together. At the same time – my team had tweeted about an upcoming interview not yet occurred – to which she questioned if that was appropriate [being very honest about not yet figuring out where the new lines are with social media – what to tweet and not tweet]. I didn’t know either so I deleted the tweets and could see some learning on both ends around the integration of pr/social media/marketing communications. Well.. I best get some sleep. I am looking forward to Saturday when I finally attend the festival as a mother and not in a virtual social capacity. * How to better price for social media and also how to price for live event coverage. * Technology needs on same day for events. This entry was posted in Blogging, Crowd Wisdom, customer experience, events 2.0, Facebook, fans / loyalty, How to, social networks, twitter and tagged #bfto, buskerfest, event 2.0, events 2.0, live blogging, social media on August 27, 2009 by Laurie Dillon Schalk. I met Mark Campbell, a social media seeding and feeding guru of VMG Cinematic today at Balzac’s in Liberty Village to shoot the breeze on social media, what clients are asking for, what the market is willing to invest in, how to use social media to engender customer loyalty, what is being recommended and various campaign work we’ve both been doing in 2009. [Mark and I have a mutual friend from Harley Davidson and so we met thru Linkedin – ah the power of social networking. VMG Cinematic is an edgy, new media shop producing enviable online video distributed socially thru youtube, digital signage, and more. They sport a client base we’d all love to play ball with including Harley Davidson, DHL, and Motorola. Their high quality work is leading to very creative customer and employee focused campaigns integrated artfully across social medias. There were a couple interesting themes in our conversation, beyond integrated social media campaigns. One in particular focused on improving marketing ROI thru clever use of content assets. I used to pull my hair out discovering various content assets being unused and not leveraged but easily deployed or strongly desired by customers. (by content I mean video, photography, copy, etc). Developing original content is hard enough and so its important to make every content piece that is developed work really hard. The time to do this is at the creation of the content and not afterward. A quick example.. in the condo development market, photos are taken throughout the whole construction process (and often live web cams accompany professional photos) and yet these photos/webcam are not made available to the buyers simply because the content did not reside or originate in the marketing department. Certainly, there are privacy and legalities to consider and yet the sourcing of content does not have to stop with the marketing department because the customer experience does not stop after the purchase. This is, in part, the beauty of studying the customer experience of buying a home and understanding how people who buy condos are very, very interested [nay emotionally invested] in seeing the progress of their home during its construction. Heck – I have friends who scrapbooks of the building of their home. [okay – now to really digress – wouldn’t it be cool to see these scrapbooks? Check out moleskine ‘s mymoleskine section for customer contributed content]. Now marry customer experience strategy, content sourcing with new and social media distribution possibilities and the world is your oyster. Back to Mark. Mark had some great examples of how he increased the payout of existing efforts by just adding a little bit more upfront investment. The old “with just a little bit more spend, we can double the return on your efforts” tactic – but an honest approach that is compelling and working for Mark and his clients. “It doesn’t cost much to add a production team” Mark said of sending a team to capture a customer event. At the end of the day, the customer had the event and a mini-documentary to release on youtube [and in my experience, often some significant internal assets – be that e-learning or corporate communications]. Mark also talked about re-using video assets, or “using the b-roll” as he called it, to extract further value from a production for creating more value for a company. Well.. the day is done. This isn’t high school.. I don’t need a conclusion to all this. G’night. This entry was posted in customer experience, Emarketing, housing / home building and tagged content re-use, customer experience, home building, housing industry, strategy on July 8, 2009 by Laurie Dillon Schalk. Okay – so its no Susan Boyle video (in reality content nor growth) – but Air New Zealand has taken the air flight safety video up a big notch with its body painted staff giving a revised safety video. I’m certain any customer experience mapping (a.ka. figuring out the customer interactions including the boring painful interactions of in flight experiences) would uncover some issues around air flight safety explanations – so it is interesting to see Air New Zealand take this experience up a notch. Interestingly, Air NZ are doing a great job of reusing content assets by uploading to youtube and allowing some viral eyeballs from youtube. How many times have I tried to get my own companies to think about the reuse of assets online. I’m not suggesting posting print grocery flyers online in pdf format (egad – does that actually work?) but using youtube for video is a fantastic reuse. I’m happy for the body painter that Air NZ is exposing (excuse the pun) the video outside of those who fly Air NZ. This entry was posted in Branding, customer experience, youtube on July 5, 2009 by Laurie Dillon Schalk.